I was rather bummed that scheduling conflicts kept me from running my beloved local Hot Chocolate race. I hope everyone who ran it had a great time and enjoyed the post race fondue. Mmmm... I digress. Even though I wasn't free on that Sunday morning, I still wanted to do a race, and I decided to join a couple of teammates for a local 5K on Saturday instead: the March Forth Fun Run. For me, this was the shortest amount of time between signing up for a race and then running it; I registered less than a week beforehand. It was rather liberating not bringing weeks of anticipation and expectations to the start line. Plus, I was very much on board with the charity supported by March Forth: all proceeds from the run go to Leukemia and Lymphoma Society. This year they raised over $10,000! 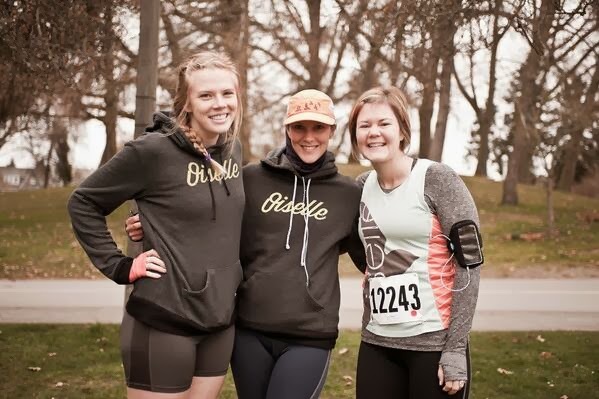 It's a Green Lake race, so you pretty much run a loop around the lake. I love these races, though, because they're never at some crazy early hour, probably because street closures aren't necessary. This race started at 9:30AM. I also like Green Lake because it's pretty easy to park anywhere around the lake. You're never more than a mile or two from the start and those miles can be used as a warmup or cooldown. I met up with my teammate Lauren and we drove over, parked about three blocks from the start and joined our other teammate Portia for a nice and easy warmup mile. 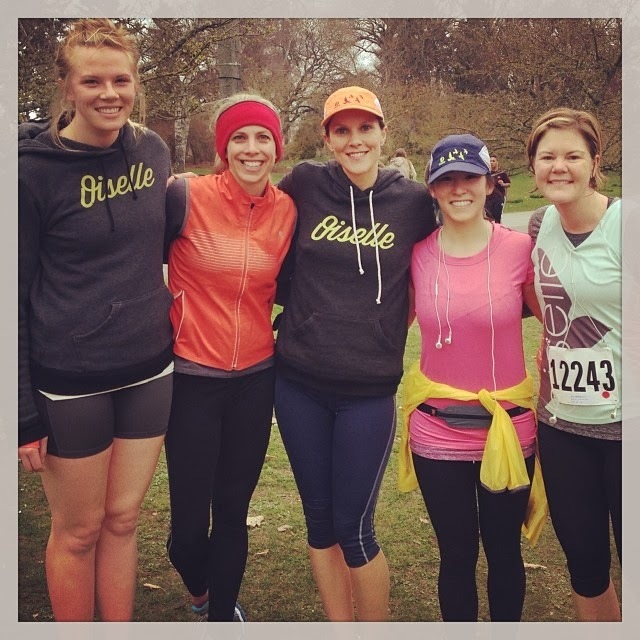 The weather held up perfectly; it was a bit on the chilly side in the low 40s, but after our warmup, I felt great in knickers and my lux long sleeve under my singlet. As we waited to start, we were treated to the musical stylings of the Sounders FC Marching Band. I love marching bands. They make me feel nostalgic for high school and college football games and automatically put me in a pumped up mood. As advertised, they started right on time and we were off at 9:30 on the dot. There wasn't anything set up to corral the runners as the start, as the timing mats were on a little grassy hill and not a path or road. People kept filing in from the sides and it was a bit crazy for the first half mile or so. According to Lauren, who was actually running behind me (because she's coming back from an injury), I was a dodging peeps like a pro. Apparently this is true because, as usual, my first mile was my fastest at 8:30. Aaaand, as per my usual, I felt sort of like death warmed over in mile two - as evidenced by my 9 minute mile pace. I even slowed to grab a Nuun at the one water stop because, hey Nuun!! YES. I got a nice side five from teammate Jen who was in town visiting and that gave me a bit of a boost. And since I am a rather predictable person, I perked up a bit in the last mile, especially when yet another teammate appeared on the course. Sarah ran up alongside me and all I could do at two and a half miles into a 5K was give a little wave, a big smile and kinda shake my head "no" as in "no, I cannot talk to you right now!" She ran ahead and I was thinking, is she trying to pace me? Urgh, maybe I should try and chase her a little. As it turns out, she was running ahead to turn and take a picture of me, but I think I caught up to that speedy girl a bit! Either way, I can thank her for bringing me back under a 9 minute pace with my final mile clocking in at just about 8:45.
heading toward the finish - more free race photos! Final time was 26:44 and I didn't meet my sort of last minute goal of beating my Mustache Dache time. I'm blaming that on giving in to the temptation of that tasty Nuun on course. But, I felt really good about my effort and the fact that I didn't have any hamstring pain this time around. Yay! In addition to bottled water, there was plenty of goodies at the finish (bagels, chips, chocolate milk, bananas, etc.) and Walgreens was handing out little first aid kits, which I love getting at races to stash in my purse. Kids go through a lot of band-aids, yo. And the race shirts are soooooo cozy. 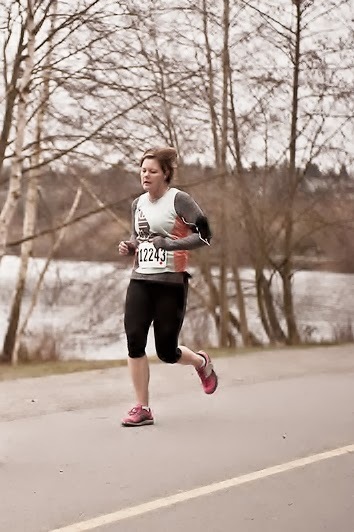 I just love these smaller races and hope that I can run this one next year, depending upon what the 2015 Hot Chocolate season brings and where it might fit in with the Lake Sammamish Half. I really would love to do that one again and it's usually in early March... Anyway, if you have the opportunity to, definitely sign up for this race! Congrats, Andrea! Sounds like it was a great race.